Anything with browned onions is good, and turnips are no exception. I had just picked up some leeks so while boiling my peeled and cubed turnips I sliced and sautéed several in butter until they started to brown careful not to let them burn. At this point I turned down the heat and added some more butter and kosher salt. 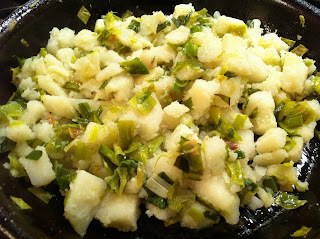 After draining my cooked turnip cubes I added them to the pan with the leeks and mashed slightly leaving them somewhat chunky. The buttery, salty, sweet turnip thing was a super tasty combination…we don’t eat turnips often enough.